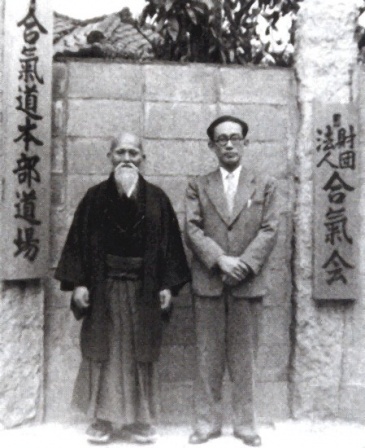 Kisshomaru Ueshiba was born on June 27, 1921 at the Omoto-kyo compound in Ayabe, where his father Morihei Ueshiba opened his first dojo, the Ueshiba Juku. 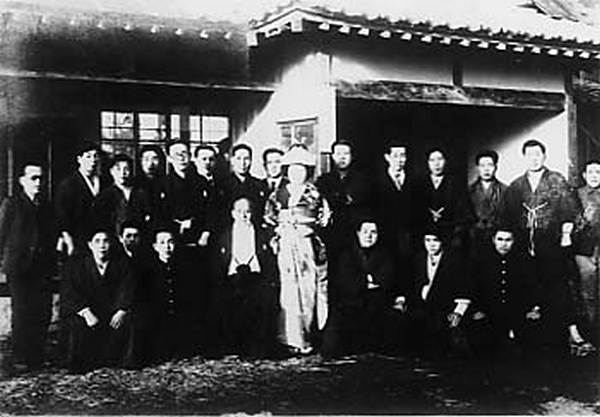 In 1927 he and his family moved to Tokyo, where his father would open the Kobukan Dojo – which would eventually become Aikikai Hombu Dojo. 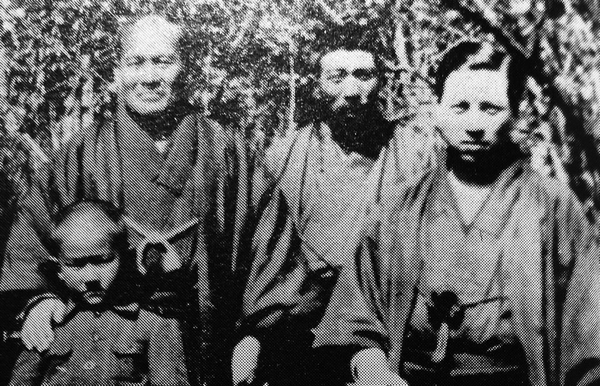 In 1942 Morihei Ueshiba told his son to “Defend the dojo with your life!”, and retired to the countryside in Iwama. 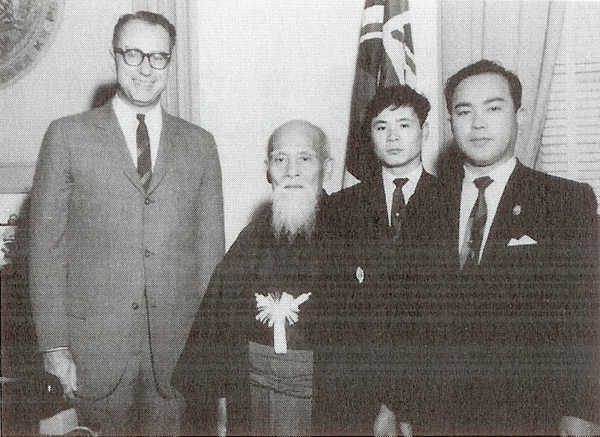 After the passing of Morihei Ueshiba on April 26 1969 he became (after some disputes involving his brother-in-law Koichi Tohei) the second Doshu of the Aikikai organization. Until his death on January 4th 1999, Kisshomaru Ueshiba would be the primary presence and director of the post-war Aikikai organization. 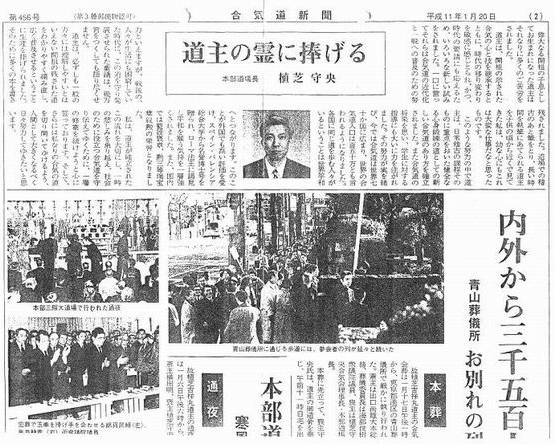 The current article is the English translation of an interview that originally appeared in “Answers from Budoka” (“Budoka no Kotae” / 武道家の答え), published by BAB Japan in 2006. In this interview Kisshomaru Ueshiba Doshu discusses his effort to change and adapt his father Morihei’s art for a modern world. The fruits of those efforts have spread Kisshomaru Ueshiba’s version of the art across the world, but have left his son, San-Dai Doshu Moriteru Ueshiba, with challenges of his own. I had a private conversation with H Isoyama a few months ago. 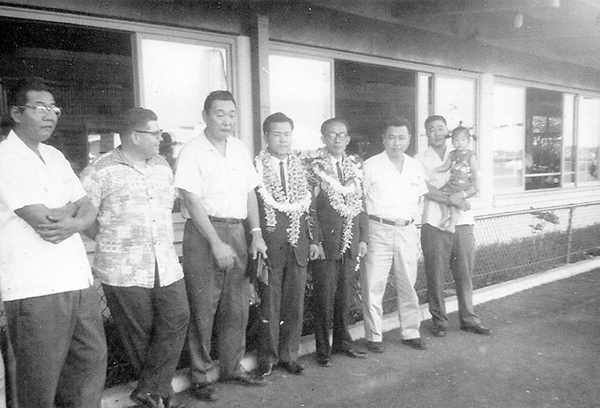 Isoyama began training in Iwama at the age of 12 and grew up under Saito’s tutelage. Kisshomaru was also there and the Hombu was actually in Iwama at the time. 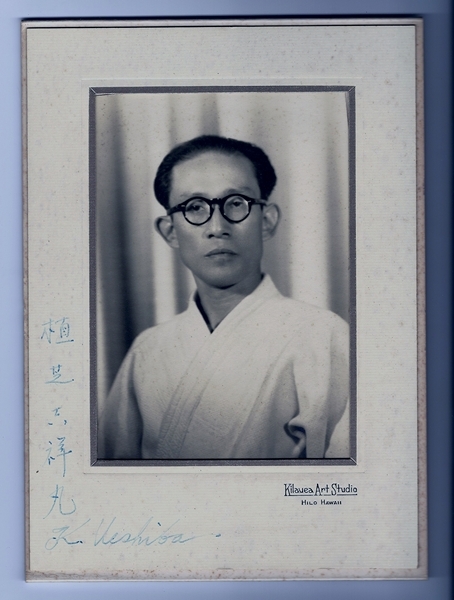 He noted that a recurring problem in Iwama and in Tokyo was “what to do about the old man,” up on the floating bridge with his deities, whereas Kisshomaru was concerned with trying to fashion aikido into an art that could actually survive in postwar Japan and that meant making some important compromises. I think you can see Doshu’s dilemma (*the current Doshu, Moriteru Ueshiba). He has to continue to teach the ‘essence’ of the art, but without knowing very much about what his grandfather actually did. He is a few years younger than I am and all he knows has been filtered via Kisshomaru and those deshi of Kisshomaru’s generation. Doshu’s son Mitsuteru will have an even bigger problem. Apart from a few exceptions like Tomiki and Tohei, Kisshomaru allowed the old deshi like Tada, Yamaguchi, Arikawa to get on and teach what they had learned from Morihei Ueshiba directly, in so far as they understood this. The variety was allowed to flourish, but with the passage of time there has been an inevitable dumbing down and an increasingly frantic insistence that what the Hombu is doing is the only means of aikido salvation. I think if the Aikikai could make the eight basic waza into sacraments, they would leap at the chance. Q: First I would like to ask you, what are the current goals for your Budo training? A: As to the current goals of my Budo training, I am not thinking at all of things such as becoming strong through Budo, or striking and throwing an opponent. I am thinking of it as a method of lifetime training through the Way of Budo. It is improving the human spirit and pursuing a leap of the psyche – training with like minded people and extending the influence of those people into society, not only in Japan, but also overseas to build a worthwhile and peaceful society. It is because the way to society is through this path that the International Aikido Federation (IAF) was formed – and happily, Aikido has recently experienced widespread growth overseas. Q: What is the current condition of Aikido overseas? A: Of the Japanese Budo that are popular overseas, the present state of affairs is that Aikido follows after Judo and Karate. For example, if I speak of the case of France, which has not hesitated to accept the influences of Japanese culture, there are about 378,000 people doing Judo followed by about 78,000 people doing Karate. Aikido is said to have about 40,000 people, and I have heard that is followed by Kendo with a few hundred people. So there’s that much of a gap between them. Since becoming the world’s Judo and raising their flag at the Olympics the societal awareness of Judo has become much greater. Karate is not only Japan, Chinese and Korean Karate have also become much larger. Karate is a fierce Budo that focuses on striking and kicking, and is popular with young people. I think that it is excellent for training the minds and bodies of young people. However, I think that there are some things in Aikido that are a little different. That is, from the past Aikido has forged techniques through typical methods of Budo conditioning, and that there are no shiai (試合 / “contests”). Because when one competes one becomes caught up with thoughts of winning or fear of failure. In the midst of the movements of Aikido’s techniques, in natural movement, we pursue the unification of body and mind (心身統一 / “shin-shin toitsu”) – it is where we fulfill that to the greatest degree that we refine our humanity. Q: Do have some special method of training? A; The thought of a special method of training has never crossed my mind. I believe that the most important factor in the value of modern Budo is that anybody can practice it comfortably in any location. That is an absolute requirement, because it will then become a positive force for society. Nowadays, one cannot go up into the mountains to train like a warrior from the Sengoku Period or feudal times and then do something like declare “I have become strong” and make your appearance as a master… I suppose that there will be some people who will approve of that, but it doesn’t match the flow of today’s society. There should be a Budo that is cultivated from the midst of present times. If it is not a Budo that can live in modern times then there is no societal value. Q: It is said that Aikido is a Budo that pursues spiritual values, in what form does it appear overseas? A: As regards overseas, there are those who have an interest in Zen or eastern culture such as Chado (tea ceremony). It is a particular characteristic of Aikido that there are many intellectuals who have an interest in it. Previously I brought up the case of France, where there are 378.000 people practicing Judo, but in contrast to Judo and Karate it is a particular characteristic of Aikido that the number of children practicing is very small. So when one is older, even elderly people can practice. In Aikido my father used the training methods of many of the Kobudo (“ancient martial arts”) – these, driven by spiritual philosophical principles for today’s world, are Aikido. When I went to New York in Showa year 38 (1963) a professor from New York University said “Even someone my age can do Aikido. I practice Zen, but Aikido can be interpreted as moving Zen, can’t it?”. Then I said “There are those people who say that Aikido is moving Zen”. After I said that there – before I knew it the mass media and others such as Buddhist priests started telling me that Aikido was moving Zen. Q: What are the essential points at which Aikido differs from other Budo? A: There are nine groups registered with the Budokan as Japanese Budo. Including the Budokan there are ten groups that make up the Budokyogikai (武道協議会). Judo, Kendo, Karate, Shorinji, Naginata, Sumo, Kyudo, Jukenjutsu and then Aikido, but Aikido is the only one of these that does not have a competitive form. I would be happy if you could be aware of the fact that it is in this area that Aikido has a different perspective than other of the standard Budo. Q: Does that mean that Aikido is not a type of Kobudo? 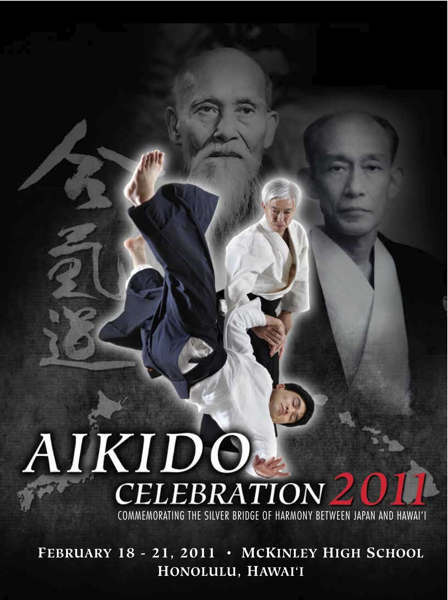 A: Depending upon the person there are those who say that Aikido may enter the category of Kobudo, There is certainly no mistaking that the fact that Aikido originated from Kobudo, and in Aikido my father used the training methods of many of the Kobudo – these, driven by spiritual philosophical principles for today’s world, are Aikido. For that reason I always say that Aikido is a question of the spirit. Please think of it in this way. Q: Who are the Budoka that you most respect? Q: Can I take that to mean that this is because Morihei Sensei had his eyes on the same goals as you do? A: There are those who say that my father was strong. That may also have been part of it. But that kind of thing is no reason for respect. It is only because he established a new Way of the Spirit called Aikido that he is worthy of respect. My father was a man of the old school, so it may be that there are some things about me that he was not satisfied with. However, things were left to me because I was his child, so I did my best to develop this Way into a modern Way. Q: Saying that, if I were to ask you what the secret teachings (極意 / “gokui”) of Budo are you might call that something like nonsense? A: I’m glad that you said that. Around the beginning of Showa (1926-1989) , when a person asked my father “Sensei, what are the secret teachings? Please show us the secret teachings.” he replied “Isn’t everybody doing the secrets? I show the secrets from the beginning. There’s no this is secret, that is secret, there’s nothing incredible. That’s why if you look at the scrolls you won’t understand anything. There’s no this is secret, that is secret, that’s just magic tricks. It’s nonsense to even discuss it.”. I believe this as well. The secret teachings of the past would just come naturally through practicing wholeheartedly. It was a matter of the spirit, one would just suddenly say “Ah, I see!”. Among Kobudo people there are really those who talk about ridiculous things like this is secret or that is secret, but from my point of view that’s not acceptable. Q: What motivated you to pursue Budo? A: In the past my father said “I am not planning for you to succeed me in Budo”. However, after the war there wasn’t any particular work available. At that time I spoke to some people who had come back home after studying abroad. With the end of the war the local Japanese students felt as if they were suffering from things like dementia or castration, and were dealing with it by running away secretly from place to place. I truly felt miserable as I listened to them. I thought “Japan fought against the rest of the world, that’s how much strength the Japanese people possess. What can I do?”. So then I asked my father if there wasn’t something, if there wasn’t something from the traditions of Japan. As I was pondering that, I found that there was something. Aikido. 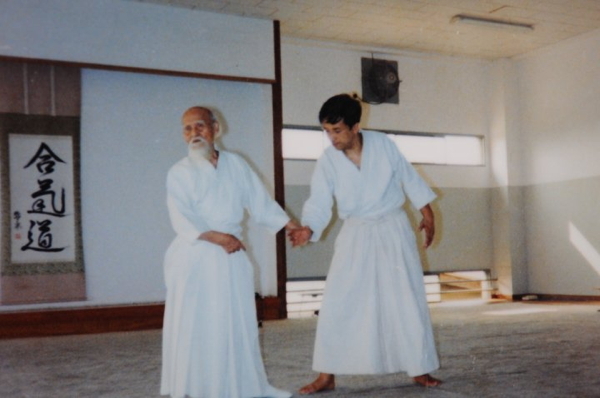 I thought that in Aikido – the end of my father’s religious training – was a really wonderful expression of the Japanese and Asian people’s culture. Then I worked to move Mac Arthur’s command division and the Ministry of Education, and the Kobukai that had existed up until that time was re-recognized in February of Showa year 23 (1948) as the national organization of the Aikikai Foundation. My father at the Ibaraki Dojo said “I am focused on my Budo training, so you do it! You can more or less handle things.”, so I went ahead and started things in Tokyo. Up until that time at the Ibaraki Dojo one could not become a student without an introduction, so there were many distinguished personages, these certainly weren’t regular people. It was through the cooperation of such people that the Aikikai was able to spread nationally. To speak of that, the Tokyo dojo until that time was a wooden structure that leaked when it rained. Moreover, there had been a number of fires, which we extinguished each time with buckets of water. Also, there were many war refugees in the dojo. It took until around Showa year 30 (1955) to move all of those people out. When the older students gathered to train we started to say “Let’s set our sights overseas”, and we turned our eyes to enthusiastic young people to transmit the virtues of Aikido. So it was that the with the expansion overseas we followed Judo and Karate in their development. 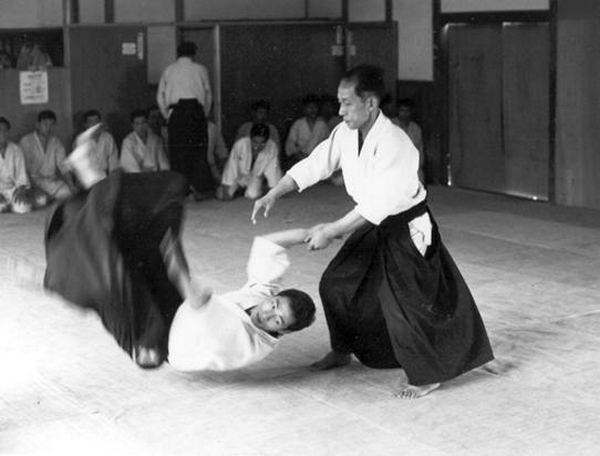 Furthermore, around Showa year 30 (1955) I left my company in order to give my undivided attention to Aikido and create a student based organization – I sent shihan to around 150 schools to develop the organization. There we go back to what we discussed at the beginning, My feelings that grew after the war when I first thought to devote myself to Aikido. However far the Japanese people may fall, they possess something that is peculiar to the Japanese people. Everybody knows that Einstein is a famous scientist. His exceptional brilliance was the foundation of what is called his insight. To express things differently, as in the example of a spinning top, the pursuit of that “perfectly clear state of mind” (澄み切りの境地 / “sumi-kiri no kyouchi”) is the goal of Aikido. I think that the prosperity of Japan is the result of drawing on the wisdom of the people in each of their fields. However, the prosperity of today’s Japan is not enough, I think that spiritually there is also an aspect of that prosperity that is very negative. I believe and desire with all my heart that the Aikido that I have explained to you can be something that can, at the very least, compensate for some of those negative aspects. Q: Thank you for taking to time out of your busy schedule to cooperate with us.